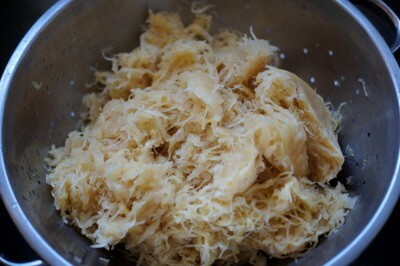 When I was a kid, my mom would often make sauerkraut for dinner. Frankly, I never liked it much, mostly because it was, well, sour. But, during a stay in the Alsace region of France --- in the city of Strasbourg, to be exact, I had a sauerkraut-based meal so incredible that it is permanently etched in my mind. 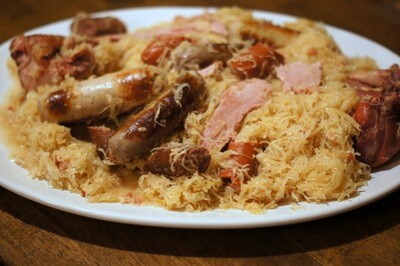 It was at a restaurant called Maison Kammerzell and I ordered the choucroute garnie. 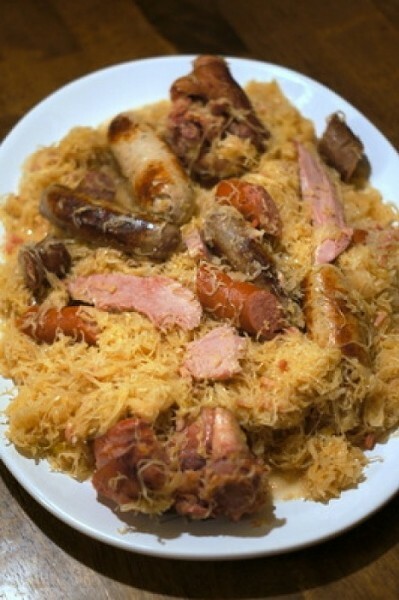 It was simply amazing -- a hefty dish of perfectly braised sauerkraut (choucroute) dressed (garnie) with various meats and sausages. 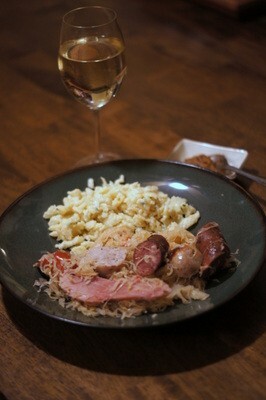 Ever since then, I've been trying to recreate the marvelous flavors of that choucroute garnie at home. And, while I'll probably never quite hit the high notes of Maison Kammerzell's, the version that follows is pretty darned good. It's a perfect single-pot meal for a cold winter's evening. 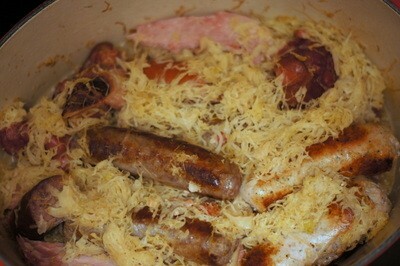 A note about the recipe: Choucroute garnie is ripe for experimentation. Exact amounts and measurements aren't necessary and no two recipes are exactly alike. So, feel free to substitute and include your favorite meats. 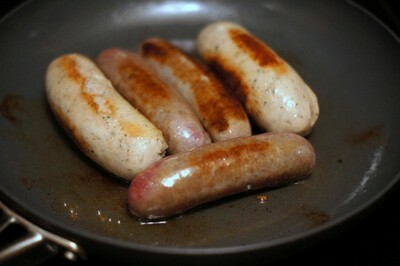 If you prefer weisswurst over bratwurst, for example, by all means, put them in. I've even seen seafood versions of choucroute garnie. So, my recipe is really just a starting point; have fun and make it your own. This recipe easily serves 6-8 people. Before you begin cooking, there's some prep work involved. 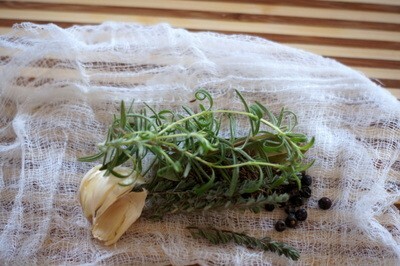 First, take a piece of cheesecloth and make a bouquet garni packet with the juniper berries, cloves, garlic, caraway seeds, peppercorns and thyme. 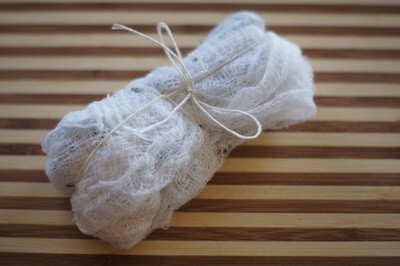 Wrap up the bundle and tie with kitchen twine. 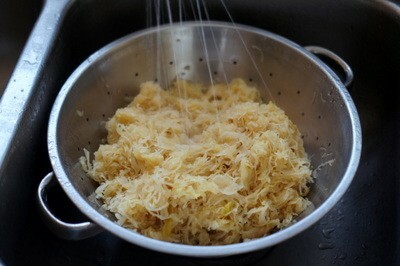 Next, prep the sauerkraut by rinsing it thoroughly in a colander under cold water. 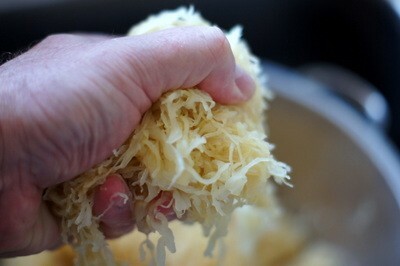 Drain as much water as possible from the colander, then squeeze the excess water from the sauerkraut using your hands. 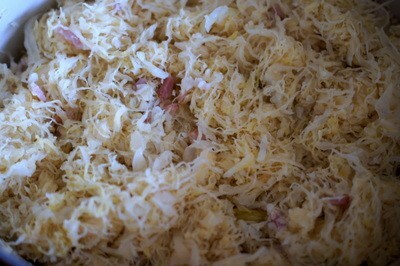 Set the sauerkraut aside. 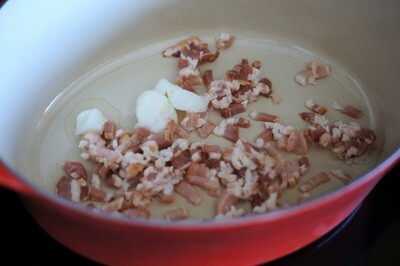 In a large dutch oven or other cooking pot, melt the duck fat and cook the bacon until it's just lightly browned. Add the sliced onion and cook over medium-low heat, stirring occasionally, until just wilted -- about five minutes. You don't want to brown the onion. When the onion is wilted, add the sauerkraut to the pot. 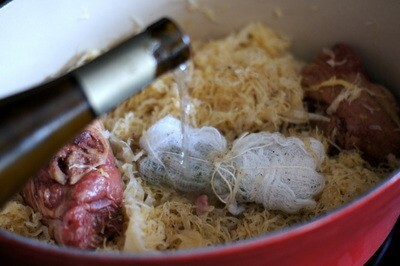 Next, add the ham hocks and the bouquet garni, along with the wine and water, and bring the mixture to a simmer. 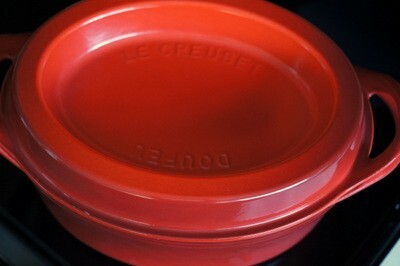 Cover the pot and simmer over low heat for 1 1/2 hours. Toward the end of the 1 1/2 hours cooking time, sear the uncooked sausages in a tablespoon of duck fat, lard or olive oil in a skillet, until browned on each side. 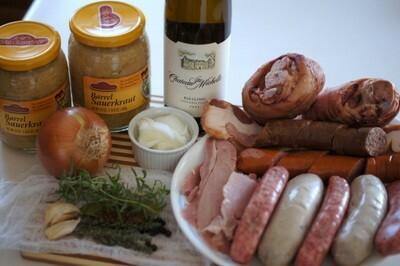 Add the browned sausages to the choucroute, along with cooked meats like the jagwurst, kielbasa, ham or smoked pork. Cover the pot and cook for an additional 1/2 hour. 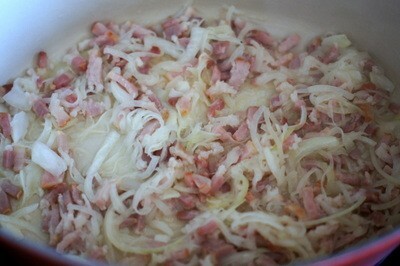 To serve, discard the bouquet garni and arrange the meats atop the sauerkraut on a large platter.